In the following article Dr. Clarence Spigner, Professor of Public Health at the University of Washington, Seattle, describes the life of the first patient to die of Ebola on U.S. soil and the larger crisis of Ebola in West Africa. He views it as a consequence of a long history of disease, poverty, and underfunded health care systems in the West African nations of Guinea, Sierra Leone, and Liberia which are at the center of the 2014 epidemic. On September 20, 2014, a forty-two year-old Liberian native, Thomas Eric Duncan, arrived in Dallas, Texas from a plane flight that originated in Monrovia, Liberia. Duncan came to the United States ostensibly to reunite with his estranged teenaged son and the boy’s mother, Louise Troh, who had at one time been his girlfriend in Liberia. Troh and her son lived in Dallas. Unknown before that point, Duncan entered the international public consciousness because he had flown from the hot zone of the Ebola virus outbreak then occurring in West Africa. On March 30, 2014, Liberia reported two cases of people with the Ebola disease. Six months later on September 30, over 3,000 people had died from Ebola in West Africa including more than 1,000 in Liberia alone. Duncan, who would be the first reported case of Ebola in the United States and as of this writing, the only fatality, was symptom-free and not contagious when he left Liberia by way of Brussels, Belgium and Washington, D.C. The deadly Ebola disease has symptoms similar to the mosquito-borne infectious malaria. Both malaria and Ebola are endemic to Africa, though malaria is now far more widespread and dangerous. So is West Nile Disease which like malaria is mosquito-borne and was first identified in 1937 in the East African nation of Uganda. Unlike those diseases, Ebola is spread by physical contact with an infected person or animal. The virus is not airborne. The rapid spread of Ebola and the even more rapid spread of fear of a worldwide distribution of the Ebola virus comes from the knowledge that diseases like this follow the same historical pattern when cargo sea ships brought smallpox, yellow fever, measles, and other infectious diseases to the indigenous people in the New World and syphilis from the New World to the Old World. Today, sea vessels have been joined by the speed and efficiency of airplanes which has reduced the time of global travel to days and in many instances hours. Thomas Eric Duncan’s flight from Monrovia to Dallas in twenty-four hours is stark testimony to the impact of global travel. There are four strains of Ebola, a hemorrhagic fever disease (hemorrhagic meaning those illnesses caused by several unique clusters of viruses with zoonotic origin): Ebola Zaire (EBO-Z), Ebola Sudan (EBO-S), Ebola Tai (EBO-C), and Ebola Reston (which only affects monkeys). The name of the disease derives from the Ebola River in the north-central region of the Democratic Republic of the Congo (formerly Zaire). Medical scientists first identified Ebola as a disease in 1976 in Zaire where 280 people died and Sudan (now South Sudan) where it killed 151 people. In Zaire, the death rate was 88% when the disease swept through villages along the Ebola River in the northern section of the nation. Ebola spread again in Gabon in 1996-1997, taking 65 lives. Three outbreaks in Zaire between 2001 and 2003 killed 200. The last major outbreak before 2014 came in Zaire in 2007 when 264 people died. Ebola has also appeared in Uganda, the Republic of the Congo (Brazzaville), South Africa, and Côte d’Ivoire. The current outbreak however, has already killed more than three times the number of people who died in all previous outbreaks. It is also the first outbreak that has not been contained in a single nation. The current outbreak also differs from earlier ones in that it has moved quickly from the interior to the coastal capital cities of Conakry, Freetown, and Monrovia with their crowded conditions and impoverished but highly mobile populations. The virus can attack humans and animals. The symptoms are a flu-like with fever, sore throat, head, muscle, and stomach pains followed by vomiting, diarrhea, and rash. If not treated early with fluids and drugs, including those still in the experimental stage, the patient’s liver and kidney functions decrease and death soon occurs. Ebola is only contagious when in physical contact the patient’s bodily fluids but the patient remains contagious even after death. There is a 21-day period when initial symptoms can occur and thus the observance of a 21-day quarantine will determine if one is free of the disease. Thomas Eric Duncan arrived in Dallas from Liberia, one of three West African nations at the epicenter of the current Ebola outbreak. The other two nations are Guinea and Sierra Leone. These three nations have distinct histories, languages, and customs although in the interior of all three, where the Ebola outbreak is strongest, indigenous people often with kinship ties in the other nations, frequently cross unmarked or poorly policed borders. Guinea, the most populous of the three nations, was home to a number of small African states that were eventually conquered and colonized by the French by 1900. Known for nearly six decades as French Guinea, it broke from France in 1958 and became an independent nation. Today Guinea has an estimated population of 11.7 million people. Sierra Leone, south of Guinea but north of Liberia, was founded by British abolitionists in 1792 who envisioned it as a settlement area for African-Americans freed by Great Britain during the American Revolution as well as blacks freed in the British Isles. Jamaican Maroons were also persuaded to settle in Sierra Leone which became a British Colony in 1800 but which gained its independence in 1961. Sierra Leone has an estimated present-day population of 6.1 million people. Liberia was founded in 1821 by formerly enslaved people from the United States who were sent to this region by the American Colonization Society. Liberia officially became independent in 1847 and along with Ethiopia, was the African nation which escaped colonization after the Partition of Africa in 1885. Today Liberia has a population of approximately 4.3 million people. Despite their different histories all three nations have remained impoverished and suffered from corrupt dictatorships during their post-independence periods. Many of their best physicians, scientists, and health care workers have emigrated from these nations, preferring to work in Europe or North America. The two decades of civil wars in Liberia and Sierra Leone especially have wreaked havoc on the already modest health care infrastructure. Thus when Ebola came, it struck three of the nations in West Africa least prepared to withstand its ravages. By April 4, 2014, heath care workers in all three nations knew they were facing a potential medical catastrophe with the rise of the lethal Ebola virus. On May 26, the World Health Organization (WHO) confirmed that deaths from Ebola had occurred in neighboring Sierra Leone, and by June 17, the disease had reached Monrovia, the capital of Liberia. When the death toll reached 350 by June 23, WHO described the Ebola epidemic in West Africa as the worst the world. On July 25, Nigeria confirmed its first Ebola case, Dr. Sheik Umar Khan, who led efforts to combat the outbreak of Ebola in Sierra Leone. Khan had flown form Monrovia to Lagos, Nigeria on July 25. On July 29, he died from the disease. International Health officials now feared an outbreak in Nigeria, Africa’s most populous nation, with an estimated population of 175 million people, would mark a new level of crisis for the entire African continent and perhaps the world. Meanwhile Ebola continued to ravage Guinea, Sierra Leone, and Liberia. On July 30, Liberia closed schools and quarantined the most affected communities, actions that would be followed in Sierra Leone and Guinea. People residing in resource poor nations such as Sierra Leone, Guinea, and Liberia are far more likely to die from preventable diseases such as Ebola due to the ravages of poverty coupled with an inadequate health infrastructure. They are also at increased risk from medical personnel who reuse needles not properly sterilized. The longstanding religious practice of washing dead bodies before burial also dramatically increases the risk of family members coming into contact with the bodily fluids of an infected person. The international pharmaceutical industry, moreover, has invested relatively little in developing an effective Ebola vaccine. Until August 2, 2014, this outbreak of Ebola had not affected people outside West Africa. On that date, however, Dr. Kent Brantly, a white missionary doctor who had contracted Ebola was flown from Monrovia, Liberia to Emory University Hospital in Atlanta, Georgia for treatment. He became the first American to contract the disease who was then returned to the United States for treatment. Three days later Nancy Writebol, another white missionary working with Dr. Brantly and who had also contracted Ebola in Liberia, was also flown to Emory for treatment. By August 12, as the death toll rose to 1,000 in West Africa, Miguel Pajares, a Spanish priest stricken with Ebola in West Africa, died in Madrid, Spain on August 13. He became the first European to die from the disease. The two missionaries treated at Emory, however, were declared free of the disease by August 21. Meanwhile desperation mounted in Monrovia as security forces who had quarantined a slum area to keep the disease confined to one section of the capital, fired shots to control frightened and angry crowds trying to break out of the quarantine. A teenager was killed, the first victim of Ebola who did not die directly from the disease. Given that to this point all of the deaths were in West Africa and the two survivors were in the United States, it became increasingly apparent to many that the only effective treatment for Ebola was outside of the three most affected nations. By August 28, the number of Ebola deaths had risen to 1,550. On that date Senegal, situated north of Guinea and with a population of 14 million, reported its first case of Ebola. Six days later (September 3) the number of deaths reached 1,900 and Dr. Rick Sacra, a third U.S. missionary infected with Ebola while in Liberia was flown to the Nebraska Medical Center in Omaha, Nebraska for treatment. When the death toll in West Africa reached 2,100 by September 5, United States President Barack Obama two days later went on national television to explain the Ebola crisis, its impact on West Africa, and potential impact on the rest of the world. He declared that the U.S. needed to do more and would do more to help control Ebola. When the death toll reached 2,461 on September 16, the United States sent 3,000 military engineers to West Africa to build health clinics and to help train African health care personnel. They faced a particularly daunting challenge. Of the 375 health care workers who had contracted Ebola since March, 2014, 211 or 56% had died. Others abandoned their posts out of fear. Thomas Eric Duncan must have known he was at-risk for the disease. The barrage of media reports in Liberia and the other West African nations could not have escaped him. While in Liberia, Duncan was employed as a personal driver and a general manager for the Safeway Cargo Company although he abruptly quit his job on September 4. On September 15 he helped transport a pregnant woman, Marthalene Williams, who had Ebola symptoms, to a local hospital where she was refused admittance because of lack of space. Williams later died of Ebola. By that point Duncan probably realized that if he had acquired the disease from his September 15 contact with Marthalene Williams or perhaps earlier, that his best chance for effective treatment was in the United States. He may have also known that 53% of his fellow Liberians who had contracted Ebola since March 30 had already died. On September 19, Duncan, who had received an American visa for his first trip to the United States, went to the Monrovia Airport and according to Liberian officials, did not disclose his history of contact with Ebola before boarding a Brussels Airline flight to Brussels. Duncan was symptom-free and non-contagious when he left Monrovia and when he arrived in Dallas on September 20. There is no evidence that he contaminated anyone during the flights from Monrovia to Brussels, to Washington, D.C., and then on to Dallas. On September 24, however, he began showing symptoms of Ebola and arrived at the emergency room at Texas Health Presbyterian Hospital in Dallas, Texas. There he reported to hospital personnel that he had just arrived from Africa and was experiencing fever and stomach pains. Despite the international media frenzy around Ebola in West Africa, Duncan was misdiagnosed as having the flu and sent back to his apartment where he remained in the presence of Louise Troh and her five children. On September 28, 2014 as the Ebola death toll rose to 3,091, Duncan had to be taken by ambulance back to the same hospital that sent him away four crucial days earlier. His condition was now far worse and Texas Health Presbyterian officials contacted the U.S. Centers for Disease Control (CDC) in Atlanta, Georgia. The CDC confirmed that he was in the initial stages of the Ebola disease. Duncan would now forever be known as patient zero, the first diagnosed case of Ebola in the United States. By October 4, the worldwide death toll from Ebola reached 3,338. Meanwhile Duncan’s condition worsened. 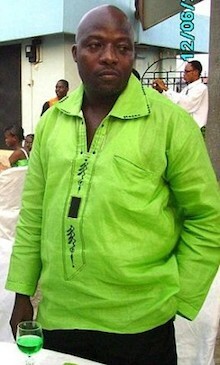 On October 8, 2014, only about six months after the first cases were reported in his native Liberia, and 18 days after he arrived in Dallas, Thomas Eric Duncan became the first person to die of Ebola on American soil. CDC: Centers for Disease Control, Outbreak Chronology (Ebola Virus Disease). www.cdc/vhf/ebola/outbreaks/history/chrononology.html; CIA Fact Book. www.cia.gov/library/publications/the-world-factbook; Aryn Baker, “Racing Ebola: What The World Needs To Do to Stop the Deadly Virus,” Time Magazine, 84:14 (October 13, 2014); Mary Dobson, The Story of Medicine: From Bloodletting to Biotechnology (London: Quercus, 2013); Joseph L. Graves, The Emperor’s New Clothes: Biological Theories of Race at the Millennium (New Brunswick, NJ: Rutgers University Press, 2003); Wolter Kluwer, ed., Nurses’ Quick Check: Disease, 2nd Edition (New York: Lippincott Williams & Wilkins, 2009); and Michael Oldstone, Viruses, Plagues & History: Past, Present and Future (New York: Oxford University Press, 2010). York: Oxford University Press, 2010).